Kaunas is the only city of the Great Duchy of Lithuania, whose armoury dates back to the beginning of the 15th century and the reign of Vytautas Magnus. 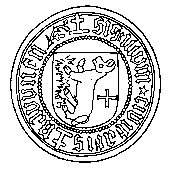 The first seal symbolising the appearance of Kaunas City self-government was created about the year of 1400. 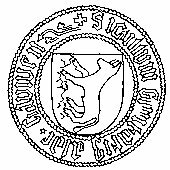 The oldest seal of the city was changed to the armorial seal. In the central place of this seal there is a late Gothic armorial shield with a round underside. It shows a Taurus (bullock) walking on the ground. At the edge of the seal the coat of arms is surrounded by the legend “The Seal of Old Kaunas” inscribed in Latin in Gothic small letters. This inscription aimed to discriminate Old Kaunas from New Kaunas. 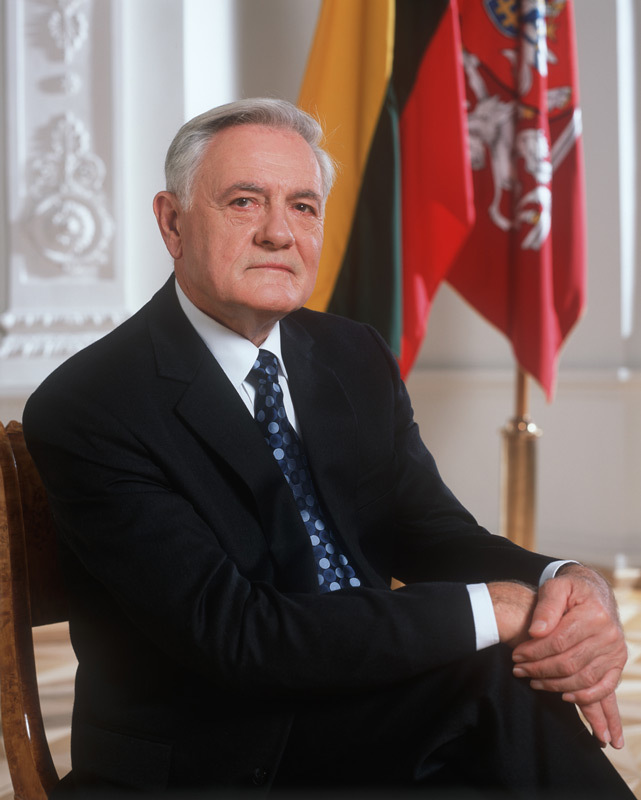 In 1492 the Grand Duke Aleksandras of Lithuania, confirmed the privilege granted to the city by Kazimieras in 1463, and endowed new privileges and liberties. Although typically to that time the privilege told nothing about the coat of arms and seal, so we can only assume that there was an oral assent of the sovereign regarding the complement of the old symbols by the cross of straight ends (also called the chivalrous cross). 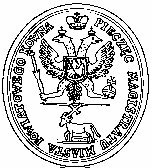 In 1801 the double-headed eagle of Russian Empire appeared in the seal of the magistracy and diet (Parliament). It was used in the most important top place in the seals, pushing down the ‘official’ city seal that had been used for centuries and in doing so symbolising Kaunas as being subordinate to the Russia state. 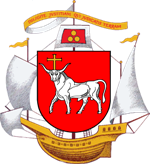 In 1845 Russian details dominated the Kaunas Emblem. This Emblem was granted for the province though not for the city of Kaunas (although the city did have a right to use it). 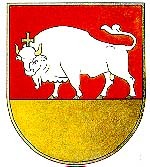 Since then the Russian Emblem idea of not separating the provincial and city emblems became firmly established as part of the heraldry of Kaunas. The real monument, made in 1843 in St. Petersburg and built in the town hall square in Kaunas, became the prototype of this emblem. On the 2nd of May in 1935 the City Council approved a new emblem (created by the artist J. Burba). It was a rectangular shield-shaped emblem representing a white bullock (aurochs) on a crimson background carrying a gold cross between his horns. The lower area was golden the same as the horns and feet of the bullock. 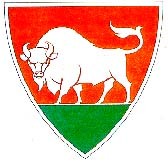 In 1969 another emblem (created by V. Banys) was approved. This one again showed the white bullock without the cross between the horns, against a deep red background with a lower potion in green. This shield however was a triangular early Gothic style shape emblem and it quickly became an established part of cultural life of Kaunas. On the 30th of June in 1993 the current historical emblem of Kaunas city was established by a special President decree and approved as our standard. It featured a white bullock with a golden cross between his horns set against a deep red background. This emblem was the result of much hard work by the Lithuanian Heraldry Commission, and finally realized by the artist R. Miknevičius. On board the ship, the shield gives the picture of a taurus with the Latin cross between the horns. According to the old legend, in Kaunas, on the confluence of the rivers Nemunas and Neris a beast with a cross between its horns was noticed. People caught this strange animal, but they got scared of the revenge of the gods and burnt it. Historians claim that this legend as well as the Magdeburg Rights granted to the city by the Grand Duke of Lithuania Vytautas, gave the shape of Taurus for the seal of Kaunas City. In the 16th century, at the concern of Queen Bona, the celestial patron of Kaunas was the Saint Nicholas, the patron of sailors and traders. In his iconography, the sailing ship, three balls and the motto “Diligite justitram grie judicatir terram” (“Love the justice on earth, Lords”) are portrayed. All this is reflected in the coat of arms of Kaunas, the city was situated on the confluence of the two largest rivers of Lithuania, and in the past, it flourished thanks to navigation and trade.